This hair belongs to the group Neovison vison, American Mink. This is a common fur used in coats, wraps, and as trim on clothing. Its presence in an indoor environment is generally indicative of clothing rather than the presence of the animal. Mink hair is around 10 to 20 micrometers wide from the root to a half of the length of the hair. 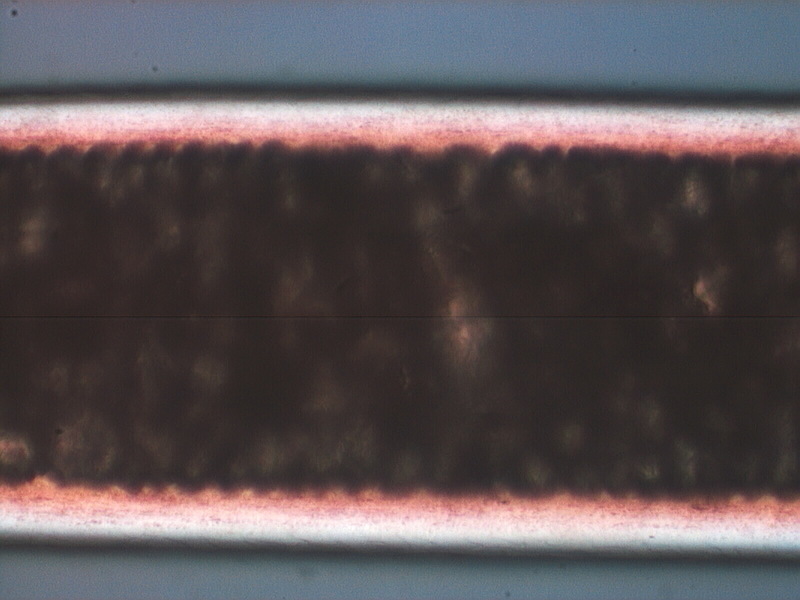 It then expands to about 100 micrometers before tapering to the tip. The medulla begins as a uniserial ladder and then becomes a lattice filling most of the volume of the hair as it expands. The cuticle pattern is coronal dentate for the first half of the hair from the root and then becomes imbricate extreme crenate for the thicker part of the hair. The scale count is just over 3 per 100 micrometers in the dentate region and 16 to 20 in the crenate region. Mink hair has a refractive index along its length of about 1.56 and perpendicular to its length of about 1.55. It has a birefringence of about 0.01 and a positive sign of elongation.